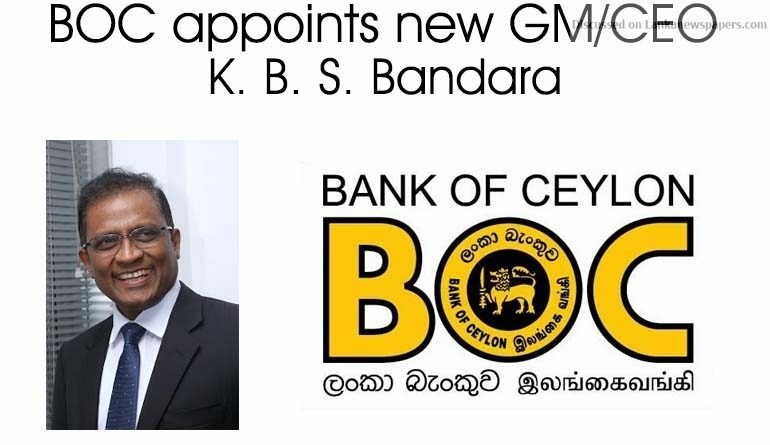 The Board of Directors of the Bank of Ceylon (BOC) appointed Deputy General Manager (Sales and Channel Management), K. B. S. Bandara as General Manager/Chief Executive Officer of the Bank of Ceylon, with effect from 22 February 2018 on the retirement of D.M. Gunasekara, incumbent General Manager/Chief Executive Officer. The new position will be a relatively challenging task, as he has to fulfil the Government mandate to list the minority stake of the Bank, as proposed by this year’s budget. K.B.S. Bandara is a Senior Banker with a career spanning over 28 years at the Bank of Ceylon. He joined the Bank as a management trainee and acquired experience in key areas of banking such as treasury management, corporate credit, international banking, branch operations, electronic banking, etc, in various capacities. He also has experience in managing the Bank of Ceylon (UK) Ltd, London as its Chief Executive Officer/Director from 2011-2012, and has successfully led several key projects of the Bank, including the London Branch subsidization, the Core Banking system upgrade, the bank’s transformation project, etc. Bandara is a member of the Governing Board of the Institute of Bankers of Sri Lanka and a Director of Merchant Bank of Sri Lanka & Finance PLC. He is also a Council Member of the National Chamber of Commerce of Sri Lanka and the incumbent President of the Association of Professional Bankers – Sri Lanka. Formerly, he was a Director of the Regional Development Bank. Prior to joining the Bank, he served as a Temporary Assistant lecturer at the University of Kelaniya and as a Statistician at the Planning and Monitoring Unit of the Mahaweli Authority. He was a resource person at the Institute of Bankers of Sri Lanka credit and investment management for several years. Bandara is a graduate of the University of Kelaniya in Physical Science with a Second Class Upper Division and holds a Master’s Degree in Business Administration (MBA) with a Merit Pass from the Postgraduate Institute of Management, University of Sri Jayewardenepura. He is also an alumnus of the Harvard Business School, USA, where he successfully completed the Advanced Management Programme. Bandara is a professionally qualified banker and a fellow member of the Institute of Bankers of Sri Lanka. He has also obtained a Postgraduate Diploma in Bank Management from the Institute of Bankers of Sri Lanka and was presented with the Best Student Award that year. ← $ 60 m EAP Group sale to UK Lyca Group today?